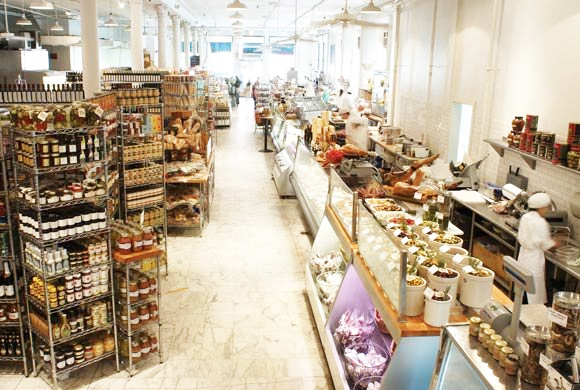 The Resident Tourist: Dean & DeLuca . . . Remember that line from The Devil Wears Prada (a NYC movie favorite!) when Nate thinks Andy quit working for Miranda, "I went to Dean & DeLuca. Man, they charge like five dollars a strawberry there. But I figured since you quit your job, we should celebrate." Yesterday was my sister's first day of work so I took a little tip from Nate, welcoming her to the city and congratulating her on her new job with a selection of tasty treats from Dean & DeLuca. Natural Spring Water for hydration, Dipping Pretzels for something salty, Raw Almonds for something healthy, Original Mints for fresh breath, Cookies & Cream Bar for something sweet, Milk Chocolate Bar for something chocolate, Dean & DeLuca Blend Tea for something soothing, New York Chocolate Espresso Beans for an afternoon pick-me-up.